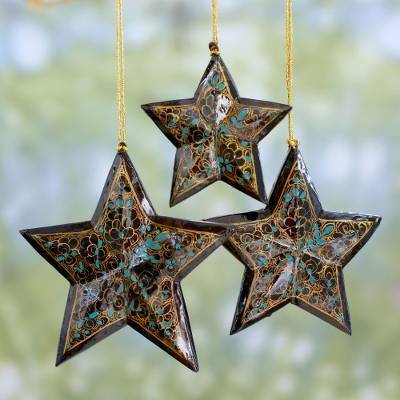 Midnight Blue Star Ornaments Painted by Hand (Set of 3), "Midnight Blue Charm"
Celebrate the holiday season with this beautiful set of three star ornaments designed by Sajad in India. Each star is neatly crafted of wood, and hand-painted in midnight blue with gold and turquoise motifs. The 3 ornaments, which are each a different size, hang from golden cords.